The list of new progressive rock bands from Italy seems to be endless. 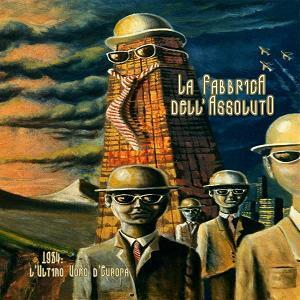 Now we can welcome La Fabbrica Dell'Assoluto (The Factory Of The Absolute), a band which takes their name from a garage in the Tuscolano district of the Italian capital and is reminiscent of the legendary cellars from the heyday of Rock Progressivo Italiano (RPI). It is also the place where Daniel Sopranzi (guitar), Michele Ricciardi (drums) and Marco Piloni (bass) grew up together and founded the cover band Progressive Effect in 2007. In 2012 Daniele Fuligni (keyboards) joined them and shortly was followed by Claudio Cassio (vocals) in 2013. Two years later they could hold their debut CD in their hands. They named it 1984: L'Ultimo Uomo D'Europa (The Last Man Of Europe). The quintet has developed an interesting concept album which was most of all inspired by the dystopian novel par excellence 1984 written by George Orwell. This book had already influenced people such as Hugh Hopper and Rick Wakeman. The boys from Rome also took their inspiration from it and came up with an album which takes you by the throat right from the start if you like progressive rock which takes you back to the golden years of this musical genre. So you have to enjoy the good old retro style performed on most of all original keyboard instruments that musicians used back in the seventies. So this means the album is loaded with the sounds taken out of the Mellotron, Minimoog and especially the Hammond organ. Therefore you can't deny some parts go in the musical direction of a band such as Emerson Lake & Palmer or The Nice but also the Dutch band Ekseption came to mind several times because of the frequent use of the Hammond organ. Being an Italian band it is obvious that their forefathers in progressive rock can be heard as well. Mainly Banco Mutuo Soccorso and Premiata Forneria Marconi. Names of bands such as Yes and Genesis do not really come to the surface that much but certainly must have been an inspiration. It is above all Van Der Graaf Generator which seems to be the main source of inspiration for this band. This is not so surprising when you consider that this band was very popular in the '70s in Italy. The frequent droning organ reminds me of Hugh Banton and the dramatic vocals move from time to time into the direction of Peter Hammill but I'll have to say the guy behind the microphone is a much better vocalist than Hammill ever was. Don't expect the same kind of screaming hoarse voice. When I heard the voice of Cassio I thought more about the front man of Lazuli. His name Dominique Leonetti. The only difference is that Dominique sings in the French language and Claudio in his native Italian. As for the music on this release you could say it fits very well with the storyline. The occasionally quite complex musical passages are outplayed here quite frivolous and apparently with the necessary ease. The alchemy on this wonderful album comes most of all from the vintage instrumentation, the atmosphere, which rejects the rules and pressure of the 'free' market, and the harmonic group also feel that harkens back to the seventies. Not only the music, but also the production conditions at the plate are thus a socio-critical commentary on Orwell's post-atomic future story in which man is only a means of production in a world ruled by the omniscient Big Brother. In the words and the music the band describes the fear, helplessness and hope of the protagonist, who wants to regain his humanity but his feelings are buried under a monotonous apathy and an illusion of freedom. The band operates as a syndicate of musical workers, because in their eyes this story can only be told in an authentic way by the working class-grassroots democracy in action in a musical experiment, as it were. The listener can expect an unpolished production barbed, energetic play and sinister atmospheres. 1984: L'Ultimo Uomo D'Europa is a dark symphony that perhaps could have become a modern classic. Throughout its length of 55 minutes, the album convinces and maybe it is really hard to find an equally exciting contemporary Italian work. It is a virtually flawless disc, a must-have for the many fans of the progressive rock of the peninsula, which could even become a classic as the years go by! So, hats off to La Fabbrica Dell'Assoluto. You almost created a true masterpiece!